FILE - This Nov. 9, 2015 file frame grab provided by Mark Schierbecker shows Melissa Click, right, an assistant professor in the University of Missouri's communications, during a run-in with student journalists at a campus protest that followed the resignations of the university system's president and the Columbia campus' chancellor in Columbia, Mo. Click, who confronted a student photographer and another student videographer during the protests and called for 'muscle' to remove them, was charged with misdemeanor assault on Monday, Jan. 25, 2106. 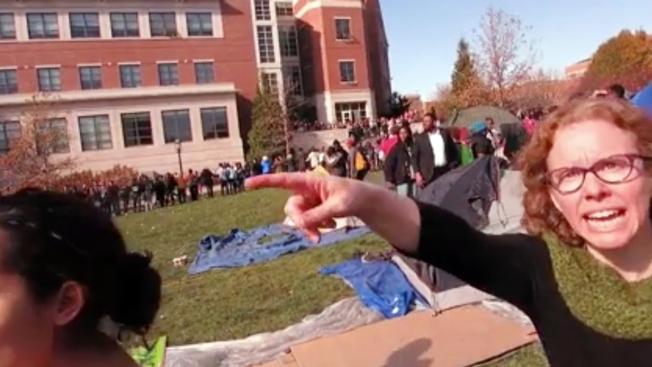 A mass media professor who was caught on video trying to block a student journalist from filming protests at the University of Missouri has been fired, the school announced Thursday, NBC News reported. Melissa Click made national headlines when a video of her attempting to kick out a campus reporter covering demonstrations by the group Concerned Student 1950 went viral. In the video, Click can be heard yelling "I need some muscle over here!" as she tries to boot the journalist and covers his camera with her hands. "The board believes that Dr. Click's conduct was not compatible with university policies and did not meet expectations for a university faculty member," Pam Henrickson, chair of the University of Missouri Board of Curators, said in a statement.